Big-bang migrations hardly ever work and usually take significantly more effort than expected. It's also hard to convince the stakeholders there's any value in the whole operation. It's much more effective to make gradual improvements. It's also more rewarding to celebrate success after every sprint. 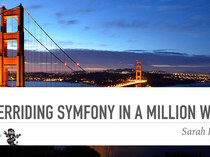 Learn how to leverage Symfony to move away from an Old School PHP Spaghetti Project™ to a modern Symfony based application. Release after the first iteration and keep improving the code base, delivering value in the same time.